Contains a special spherical powder that spreads as if rolling across the skin. Makes pores and uneven texture less visible, creating a fluffy finish. Prevents shininess and dullness caused by sebum, giving a longer lasting makeup. A face powder that creates a light, translucent veil with One Stroke. 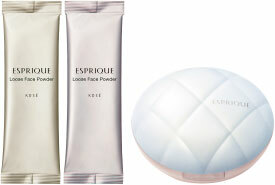 Transfer the powder to the ESPRIQUE Loose Face Powder Case (case sold separately) before use. Use for the final touches of your base makeup, or when touching up your makeup during the day. Hold the puff to the screen and turn the case upside down to get the appropriate amount of powder on the puff. Dust off excess powder on the back of your hand before spreading over your face in a light, circular motion. Apply carefully on areas that are prone to smudging such as around your nostrils, by pressing the puff down gently.